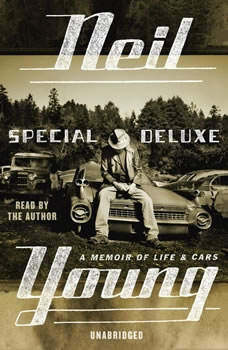 In this acclaimed new memoir, New York Times bestselling author Neil Young has fashioned another extraordinary work of reminiscences told through the lens of one of his deepest passions: cars. A lifelong devotee and collector, Young explores his love for the well-crafted vintage automobile and examines his newfound awareness of his hobby’s negative environmental impact. Witty, eclectic, candid, and filled with Young’s original artwork, Special Deluxe will appeal to car lovers as well as the legions devoted to one of the most genuine and enigmatic artists of our time.